The 96%* accurate FRISK® score is highlighting financial stress at auto dealership group AutoCanada Inc. This proprietary score, used by more than 35% of the Fortune 1000 companies and thousands of additional large companies around the world, started to indicate deteriorating financial conditions in August of 2018. The situation has only worsened since that point; here’s why you should watching more closely. As easy as counting from "1" (highest risk) to "10" (lowest risk), the FRISK®️ score provides CreditRiskMonitor subscribers a simple, accurate score that identifies public companies experiencing financial stress up to and including bankruptcy. A score of "5" or lower, within the FRISK® score "red zone," indicates that a company needs to be closely monitored. 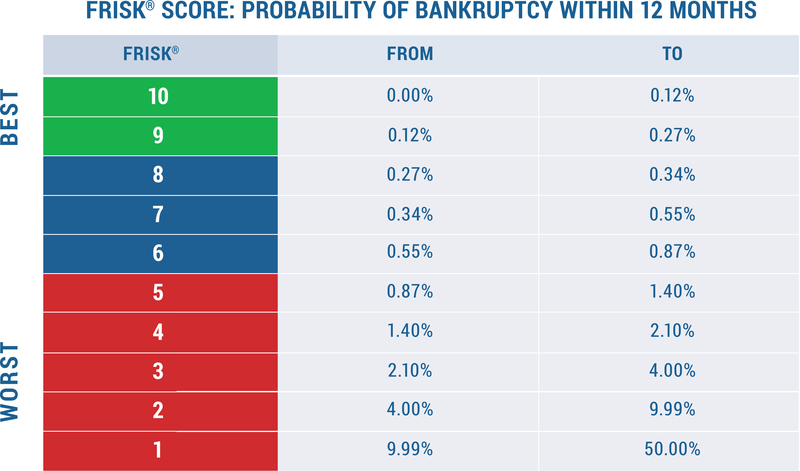 In all, 96% of public companies that eventually declare bankruptcy fall through the red zone prior to their bankruptcy filing. AutoCanada's FRISK® score first fell into the red zone in August and has since continued to sink deeper into this high-risk space. The FRISK® score blends four different data components to create this uber-accurate figure; a concoction which includes adjusted market data, bond agency ratings from Moody’s, Fitch, DBRS and Morningstar Credit Ratings, financial ratios similar to those used in the Altman Z”-Score and crowdsourced subscriber behavioral data. By dynamically melding these four metrics into one simple number, the FRISK® score provides a more accurate look at financial risk than any single metric alone would provide. AutoCanada's FRISK® score of "2," noting the swift decline from "7" in July, signals a material increase in financial risk. The largest contributor to AutoCanada's declining FRISK® score has been its deteriorating financial results. The company reported negative net income in each of the past two quarters, pushing its year-to-date net income to a loss of nearly $53 million CAD. The red ink was largely the result of impairment charges due to lower profitability expectations at a number of the company's dealerships. Falling profitability alone would be concerning; yet when you add the company's hefty debt load to the mix, it becomes even more troubling. With a total debt-to-assets ratio of 66%, AutoCanada's declining profitability suggests leverage will become an issue. The auto dealer amended a credit facility in late September, loosening a key debt-to-EBITDA credit covenant. The company also implemented a sale/leaseback deal for two of its properties in September to free up $55 million CAD in cash. Both moves appear to be in support of the early September acquisition of Mercedes-Benz dealerships in Edmonton, Alberta. Heavy leverage and negative net income has put AutoCanada Inc. in the FRISK® score crosshairs. While that acquisition could be viewed as a net positive since it expands the company's portfolio, there are larger industry headwinds at work. AutoCanada noted in its third quarter earnings release that the North American auto industry has seen sales weakness so far in 2018. This should immediately raise questions about AutoCanada's Edmonton acquisition. Record auto sales in recent years increases the chance that AutoCanada bought this dealership near the top of the market. The company just announced plans to buy a Ford dealership, as well. While the dealership acquisitions will push overall sales higher, the top line number could mask same store weakness in the underlying business. Note that same store revenue at the auto seller was down 3% year-over-year in the third quarter even though overall revenue was higher. A key factor in the negative car sales trend has been the shift toward rising interest rates in the United States and Canada. Increasing interest rates makes purchasing a new or certified pre-owned automobiles more expensive for customers. However, AutoCanada also noted that rate increases push up its financing costs: a double whammy. Nearly 70% of its debt is classified as short term. Softer sales and higher costs are never a good combination. There's no sign that rate hikes will reverse course anytime soon, with even higher rates the most likely scenario. That, in turn, would put even more pressure on the company's auto sales and operating costs. AutoCanada still appears to be a ways off from potential bankruptcy today, with its lenders appearing to be willing to provide additional financial leeway. However, the swift decline in the FRISK® score from a "7" in the summertime down to a "2" before the end of 2018 (it briefly hit a "1," the worst-possible score, which indicates up to a 50% chance of bankruptcy in the coming 12 months) shouldn't be ignored. Financial risk is on the rise. You need to watch AutoCanada closely if it is one of your financial counterparties. Faltering industry-wide auto sales and rising interest rates in conjunction with company specific issues, like heavy leverage, negative net income and potentially ill-timed acquisitions, could conspire to push this large Canadian auto dealer further down the worrying financial path it is treading. To put it simply, the best time to prepare for a potential worst case scenario is before it happens.